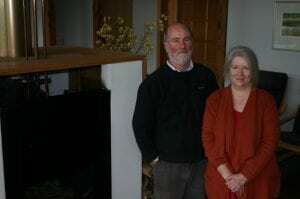 TIM Adams and Pip Watt live in a sustainably built, energy efficient house that is warm in winter, cool in summer and has no bills all year round. Tim designed their 7-star energy rated home on about 7ha at Gherang near Geelong and fitted it with alternative energy systems, heating and cooling techniques to make the building carbon neutral and comfortable. 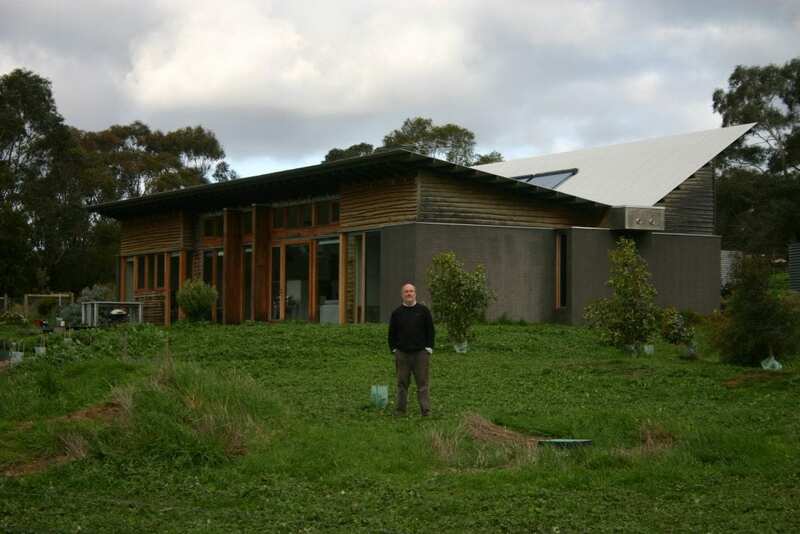 Tim is the current president of the Victorian Building Designers Association who also runs a sustainable home design business, F2 Design, to produce high performance energy efficient houses. Tim is also a BDAV accredited thermal performance assessor. He became interested in energy efficiency and sustainable building design after the 1975 oil shock. Tim and Pip have designed a home that has its own power, domestic water and waste water treatment systems. The house has 3 bedrooms, 2 bathrooms and north facing open plan living areas with glazed walls to allow maximum natural light on the floor slab to capitalise on available solar heat. There are no eaves on Tim and Pip’s home. Tim Adams designed a 7-star energy efficient and sustainably built house at Gherang that is self-sufficient in power, waste water treatment and consumption systems. Tim said the use of eaves needed careful consideration as deep fixed eaves can hinder passive thermal effects if not used intelligently. The day I visited outside it was around 13 Celsius while inside the house it was a steady 19.5 Celsius and the only footwear needed was socks. 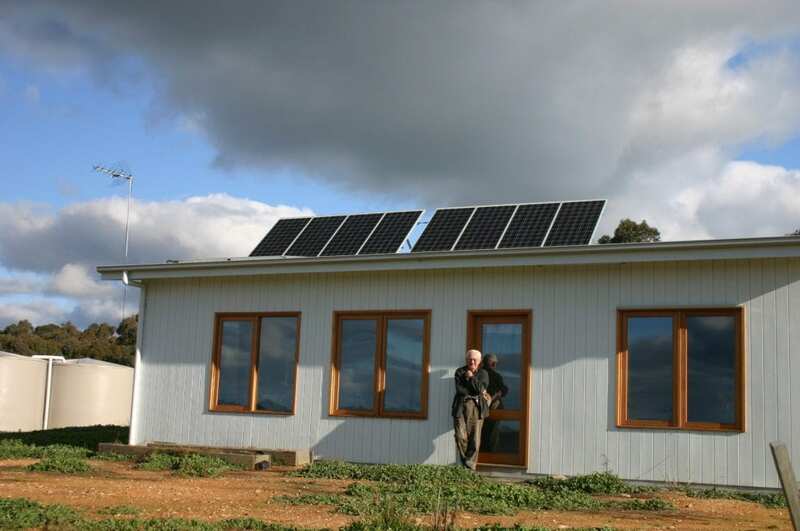 Once Tim and Pip chose to install a solar power grid feed system they carefully calculated their annual electricity use and came up with an average daily consumption figure of 9.25 kilowatt hours. They reasoned that a three kilowatt photovoltaic solar power grid feed system would capture enough sunlight to cope with their usage and produce an excess to sell back into the grid. The house has a photovoltaic solar power electricity system that consists of a three kilowatt inverter with 18 solar panels of 180 watts each. Tim said when they installed their solar power system there was a 66 cents per kilowatt hour feed-in tariff for alternative power systems so he arranged a 15 year contract on this rate with his power supply company. “The first three-month electricity bill with the smart meter in place delivered a $205 credit, even though the average daily sunshine last summer (2010) was 1.5 hours below average,” Tim said. The Adams have a normal array of household appliances that includes a kettle, toaster, microwave, espresso coffee maker, 800 mm oven, a 4 plate induction cooktop, full size dishwasher, 500 litre fridge, front load washing machine and assorted entertainment equipment. The roof’s wide V-shape design is an important part of the home’s solar panel system. The most northerly facing of the two sections of the roof is angled to position the solar panels for maximum exposure to the sun’s daily passage. The thought behind the roof design is worth further examination as being inverted means people are protected from serious injury as any fall means a slip into the roof’s long box gutter, not on to terra firma. 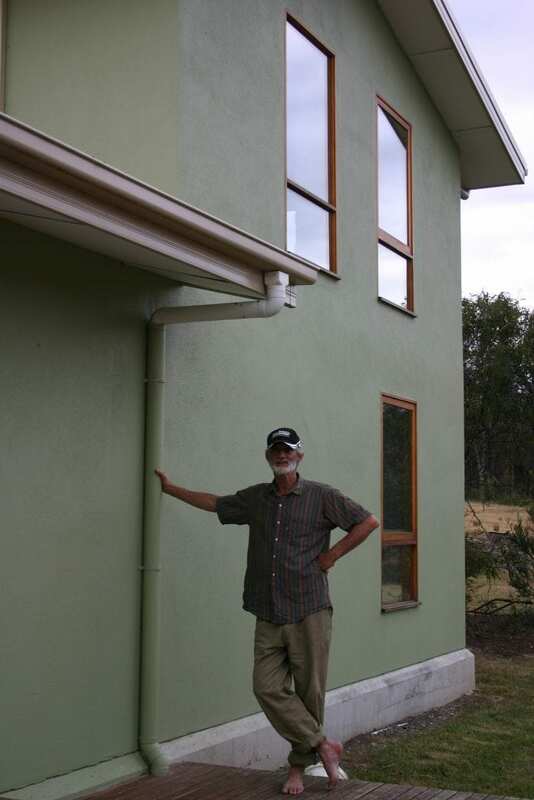 Tim designed the roof’s single box gutter so it was wide and deep enough to efficiently gather the rainwater needed for domestic use. The roof’s single box gutter is wide and deep enough to easily clean and efficiently gather the rainwater needed for domestic use. Cleaning it is also easier than a conventional gutter as it is wide (Tim calls it his lap pool) and can be easily swept and debris quickly removed. Tim and Pip have about 400 square metres of roof space from three buildings that act as the catchment for their 120,000 litre capacity rainwater tanks. Warm water for a floor slab heating system comes from 60 solar evacuated tubes mounted on the roof plus back-up from an Italian combustion boiler with a high efficiency heat exchanger. To allow the internal temperature to be controlled the house faces north and there is no under slab insulation. Laying the concrete floor slab directly on to earth allows the choice of a cooler slab on hotter days. To encourage further cooling in warm seasons the house incorporates cross ventilation design principles and employs other devices, such as temperature controlled switches on windows, ceiling fans and an evaporative water feature designed to channel cool air inside. The home is a 7-star energy rated building due to only the southern side being fitted with double glazed windows. There is insulation in the walls and ceiling with standard 3.5 rated insulation batts used. 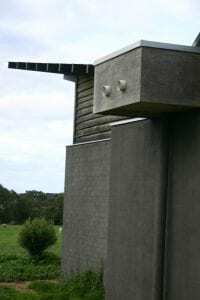 The house is essentially a square-shape, 190 square metre building with rendered brick main support walls and picture windows otherwise clad with weatherboards purchased from Radial Timber Sales of Dandenong. 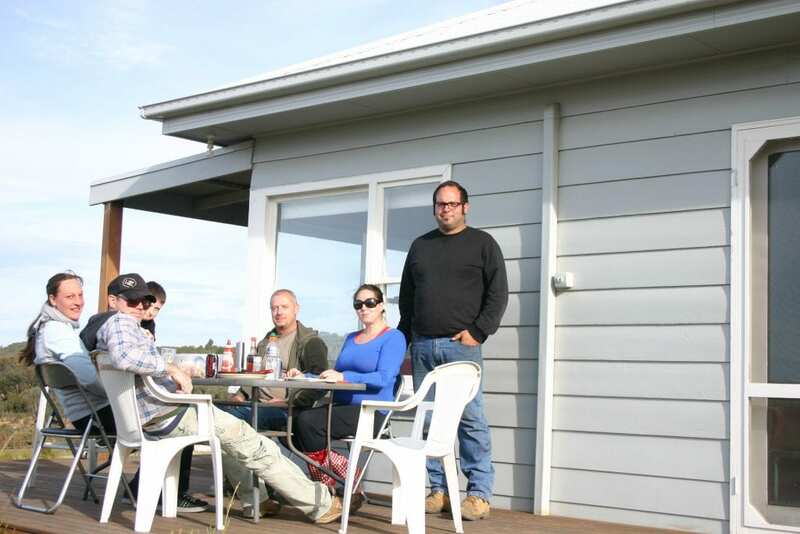 The yellow stringybark weatherboards that clad the house were produced with innovative radial cut processing and sustainable growing methods to reduce environmental impacts and waste. Tim explained that the most expensive outlay they had to build their home was for a worm-based Biolytix black-water treatment sewage system. This cost $10,000 to install and has an annual $300 service fee but they calculated this expense would be offset against the savings they make by owning their own power and water systems. 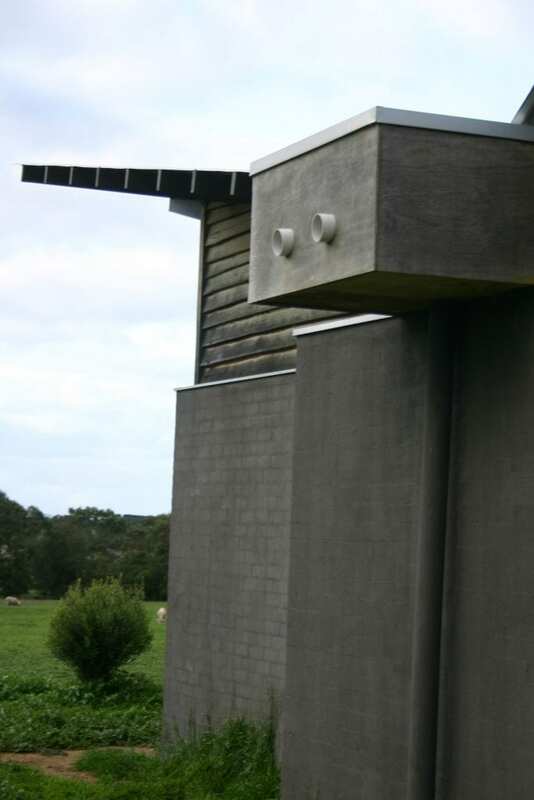 Tim said he had long wanted to build a sustainable design home to prove his design principles but also to show how cost effective it was to build such a house. “I wanted to be able to build a new house and actually put my money where my mouth is,” Tim said. “I did this (design) to use as an example. 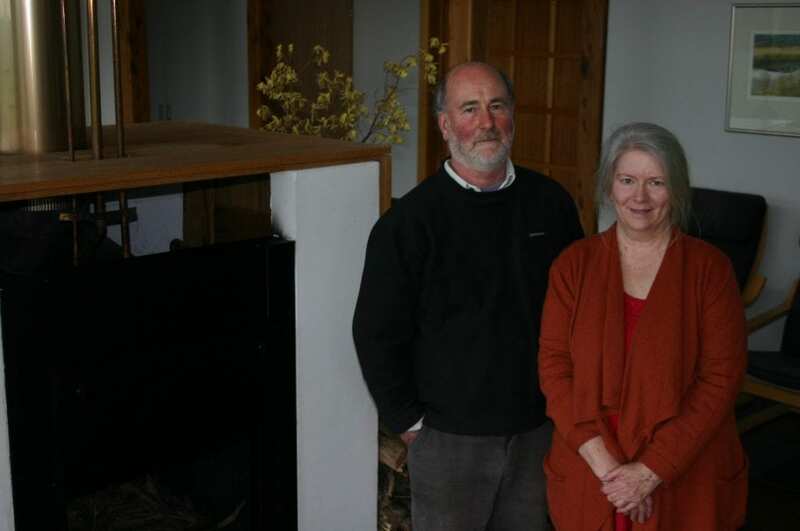 Tim Adams and partner, Pip Watt, have no utility bills in their carbon neutral house due to sustainable design principles coupled with modern technology such as an Italian built combustion heater/boiler with a high efficiency heat exchanger.